On Saturday, 18 May 1935, MAE WEST fans in Massachusetts read this enticing news. • • Stars of the screen, stage and radio are featured, starting Friday. • • Mae West, in her new Paramount hit, “Goin’ to Town”; Olga Baclanova in person; “Hollywood Hooey,” a hilarious revue with Ernie Stanton and a big company of headliners, and the special engagement of Joaquin Garay, Hollywood’s newest singer, are the four big units. • • Mae West drops her “gay nineties” cycle and goes modem as a gal of the wide open spaces who inherits a fortune and starts out to be a society lady on the money. In a novel trip behind the scenes at Hollywood, Miss Baclanova is supported by Ernie Stanton, Smith, Fields and Smith, Townsend and Boles, George Freems, twelve gorgeous Hollywood beauties and the Elida Ballet. • • Sevitzky and the Grand Orchestra — — excellent, as usual. • • Source: Cambridge Sentinel (Massachusetts); published on Saturday, 18 May 1935. • • Frank Bohm bought a generous ad in Variety (issue dated for 18 May 1912) to help publicize his client Mae West as "The Scintillating Singing Comedienne, Late of Ziegfeld's Moulin Rouge." Billboard gave the vaudevillian's act a favorable review the following month. • • Costume designer Travis Banton spoke about beauty standards in motion pictures and the measurements of Mae West, Claudette Colbert, and other top actresses. The Australian newspaper Camperdown Chronicle printed the article in a Thursday issue on 18 May 1933. 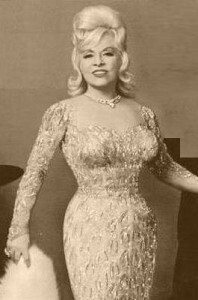 • • In February 1949, when Mae West walked out onstage as Diamond Lil during her triumphant return to Broadway [at the Coronet Theatre, 230 West 49th Street, NYC], it was the jeweler-to-the-stars Harry Winston who had supplied an Ali Baba's cave worth of glitter for this revival. • • LOS ANGELES [U.P.I.] — Actress Mae West, armed with a court ruling that she is the one and only “Diamond Lil,” has filed a new suit to stop a performer and a Riverside night club from using the name. • • Miss West, 73, filed suit in Superior Court Tuesday against Marie Lind for billing herself as “Diamond Lil." The suit also named Jack Beauvill, who runs the night club named "Diamond Lil” in Riverside. • • On Nov. 30, 1964 Miss Lind was permanently enjoined from using the name by Superior Court Judge Alfred Gitelson, who claimed the public would be confused into thinking she was Miss West. • • The Mae West Blog was started ten years ago in July 2004. You are reading the 3444th blog post. Unlike many blogs, which draw upon reprinted content from a newspaper or a magazine and/ or summaries, links, or photos, the mainstay of this blog is its fresh material focused on the life and career of Mae West, herself an American original.